Research in Motion, regardless of how you may view its recent history or its long-term future, still has a stronghold on the corporate world. Its lineup of BlackBerry smartphones are known for great battery life, comfortable keyboards with intuitive shortcuts, top-notch native email and Enterprise clients and -- most important to businesses -- unrivaled security features. Sure, its influence is waning as competitors have caught up in some areas (and surpassed it in others), but there are plenty of companies that have clung to their CrackBerries and held on tight. RIM's been hard at work trying to regain lost momentum by introducing a series of new devices featuring its latest OS, BlackBerry 7, and the BlackBerry Bold 9900 / 9930 series has been the star of the show so far. The problem is, it's not flashy enough. How is a C-level exec supposed to walk proudly on the golf course with a $300 (subsidized) phone? Talk about embarrassing. Have no fear, poor corporate top dog, luxury brand Porsche Design has come up with a solution: the $2,300 BlackBerry P'9981, a Vertu-ized version of that lesser handset you wouldn't be caught dead using. The P'9981 is available only in the UK and the Middle East for now, so until the device arrives in the US this Spring, anyone who lives stateside will have to rely on retailers to import some in. Fortunately we got the hookup by our friends at Negri Electronics, who happily lent us one of the few handsets they have in stock. As a result, we're now able to discuss the real questions circling around such a Richie Rich smartphone: what in the blue blazes makes this so expensive? Is it even worth it? 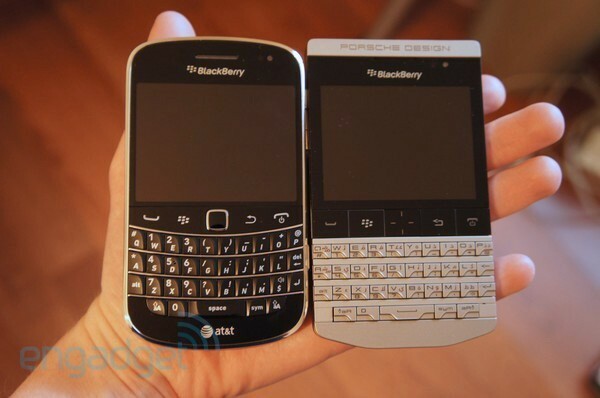 How different is it from a standard BlackBerry Bold 9900? You'll find these answers and plenty of mysteries unravelled after the break. 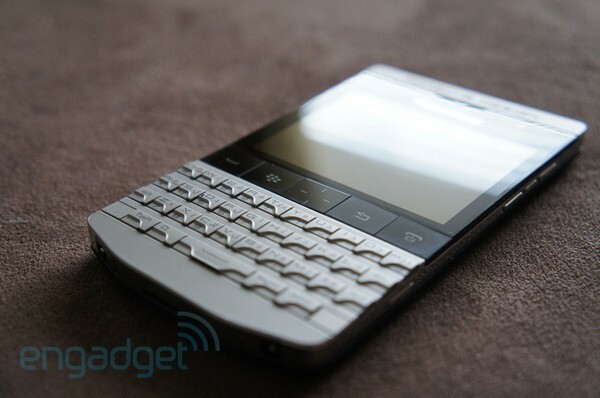 The P'9981 is little more than a luxury BlackBerry Bold 9900, and will appeal only to a select few. Be the first to review the P'9981? Handsets that cost more than two grand -- the Nokia Oro, Tag Hauer Link Phone, Motorola Aura and anything Vertu come to mind -- aren't meant to be blockbusters. In fact, most are purely intended to be sold as limited editions, with only a small number rolling off the production line. Porsche Design decided to follow the same strategy, and the company paired up with RIM to craft a new masterpiece using some of the finest materials lying around. The brand's choice of manufacturer may come as a surprise to many, given the company's recent rocky history, but it shouldn't. After all, Porsche Design CEO Juergen Gessler and several of the executive underlings use a BlackBerry as their daily driver. It's only natural, then, that if they were going to begin selling premium smartphones through their very own stores, they'd buddy up with their favorite phone maker to make it happen, right? Gessler met with RIM to inquire about a collaboration, and boom -- the rest is history. Let's begin digging into what will interest the business elite -- the phone's design and hardware. First off, we'll need to answer the first burning question: does the P'9981's cost have anything to do with functionality? After all, a device that costs that much should certainly do our laundry for us, right? Nope. Wash the dishes? Nuh uh. Walk our dogs? Strike three. The use of "fine materials," as well as the limited production and eye candy factor, all contribute to the sky-high costs, and it has absolutely nothing with what you can do with it. But then again, if functionality is all you're looking for, you can find that just as easily in top-notch mainstream devices for less than $700 unlocked. In the case of the P'9981, stamping the Porsche Brand logo across the top is what draws curious eyes (and wallets). We'll offer a disclaimer here: when mentioning that the P'9981 is eye candy, allow us to point out that we're not smitten with its looks, per se. However, there's no question it's an artfully made piece. Porsche and RIM appeared to put a solid amount of TLC into the thing, and it shows in its craftsmanship. Save for the plastic bottom, which lets the antenna do its thing without unnecessary interference, the entire body is forged out of stainless steel. The battery cover is wrapped in real leather, each individual key on the QWERTY keyboard is made of metal and the navigation buttons sitting below the screen are fashioned out of individual pieces of glass. And yet, its resemblance to the 9900 is unmistakable. There's a reason for this: they're essentially the same phone. Much like its sibling, the P'9981 sports a 1.2GHz Qualcomm MSM8655 CPU and 768MB of RAM, 2.8-inch touchscreen with a resolution of 640 x 480 (giving it a pixel density of 286ppi), BlackBerry OS 7.0 with Liquid Graphics, a 1,230mAh battery, GPS, NFC and a 5MP rear camera with an LED flash and 720p HD video capture. 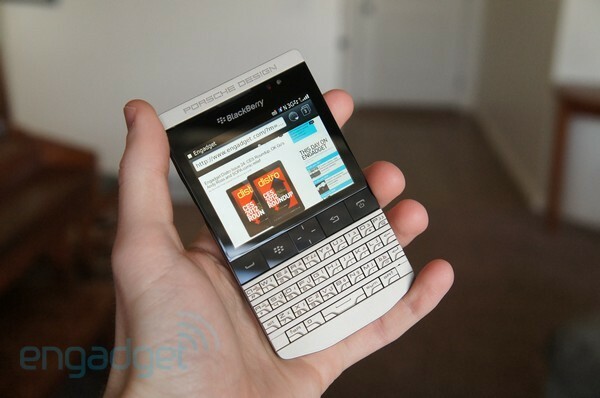 For all intents and purposes, Porsche Design pretty much took a Bold 9900 and stuck it in a more arresting chassis. Measuring in at 115 x 67 x 11.3mm (4.53 x 2.64 x 0.44 inches), it's one millimeter wider, an eight of a millimeter thicker and 25 grams (0.88 ounces) heavier, but it justifies its extra heft with a reassuringly solid feel. This hasn't been much of an issue in the past, as most BlackBerry devices we've tested have felt as though they'd survive two years worth of sporadic drops. Sure, the P'9981's sticker price is motivation enough to keep a death grip at all times, but truly, it feels as durable and well-constructed as its brethren. The button selection should look mighty familiar too: they're all in nearly the same place as they are on the 9900, with a few minor adjustments. The top is reserved solely for the lock button, while the bottom has two connector ports -- one on each end -- that allow the phone to fit perfectly on the desktop docking station that comes included in the box. Over on the left sits the micro-USB charging port and 3.5mm headphone jack, while on the opposite side you'll find BlackBerry's signature convenience key just below the volume rocker and mute button (which is sandwiched in between). Turning to the back will reveal the leather-wrapped battery cover, which features a metal bar on the top with "P'9981" engraved in the middle, and the camera and LED flash to its sides. 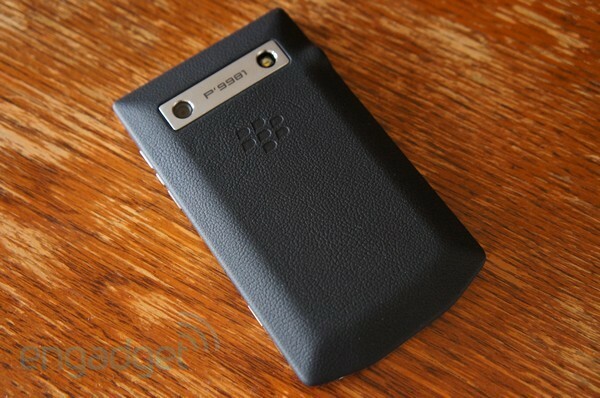 Unsurprisingly, the battery cover also bears the BlackBerry logo underneath the metal bar, embossed into the leather. 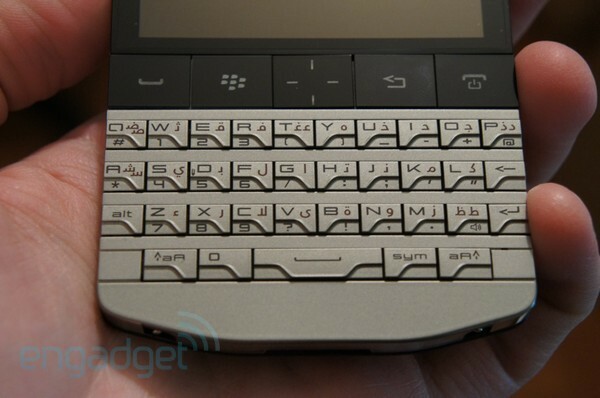 The Bold 9900 lump is still present, though the one found on the P'9981 is slightly more subtle. Speaking of which, the two covers are also different in the way they attach to the body -- the Bold's is smaller, comprising only the bump, whereas the Porsche Design model fits over the entire back of the phone. Lastly, we move to the front where we find the LED notification light, touchscreen display, the standard set of BlackBerry navigation buttons -- call, menu, trackpad, back and end / power -- and uniquely designed keyboard. More on that soon. Performance is exactly what we'd expect from a BlackBerry: great reception, wonderful call quality and robust battery life despite only offering a 1,230mAh juicepack. Our SunSpider 9.1 tests resulted in better scores than with the 9900, interestingly enough -- we averaged 2,495ms, a convincing 150ms lead over the phone's fraternal twin. Our intensive battery rundown test, however, kept the juice flowing for eight hours and fifteen minutes, which we found to be about the same as the Bold. Truth be told, the keyboard may very well be the most interesting thing about the P'9981. As mentioned earlier, each key is individually crafted from metal, which should do an even better job withstanding your repeated phalangic abuse over the years. On the version we reviewed, each key has a letter and symbol / number inscribed that glows white when you're in a low light area, and an Arabic character which glows red at the same time. Of course, it wouldn't be a BlackBerry keyboard -- at least, not a high-end one -- without the frets, and they're present here. Granted, they're located in a radically different position than the 9900, found on the lower half of each key instead of on the side. This, along with its shorter and wider keys, contribute to a more difficult typing experience. The buttons are rather clicky, yet it's not as easy to spring from one to another. The keyboard in general was still pleasant to use, but it just wasn't as good. We were hoping that some extra expense would go into making the P'9981's camera more magical than the Bold's, but it wasn't meant to be. Indeed, the five megapixel rear shooter -- complete with an LED flash and 720p video capture -- produced very similar results. Much like its brother, the P'9981 uses an EDoF sensor that's unable to take macro shots and thus up-close images are unfortunately blurry. The pictures taken from a greater distance turned out better, though we had to mess around with the white balance settings a bit to get some decent shots. As BlackBerry cameras are typically stripped bare of any other special settings, the ability to manipulate such features as exposure, saturation, ISO or anything else manually was unfortunately not an option. With 720p video, too, we achieved roughly the same results as the Bold. Because the camcorder is fixed-focus, footage remained crisp throughout the entire clip, with the exception of excessive jiggle distortion. At first we just chalked it up to having somewhat shaky hands -- a direct result of not eating our veggies, we figured -- but then we recalled having the same experience with the 9900. That's not to say it's impossible to film a home video free of the shakes, but it will definitely involve an incredibly steady hand or an armrest to make it possible. The P'9981 runs BlackBerry 7.0, and we won't spend too much time delving into the OS; we cover the topic at length in our review of the Bold 9900 / 9930. However, one thing that really sticks out in the device's firmware is -- drumroll, please -- its custom theme. 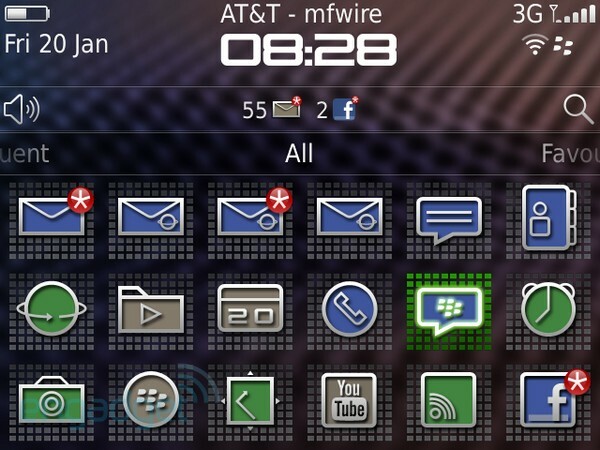 That's right, proud owners of the phone can feel comfortable knowing they're using a hoity-toity Porsche Design BlackBerry 7 theme. Honestly, very little is new outside of the home panels, which now offer a special set of icons and background options. Aside from this, the differences between firmware are very few, if any. For instance, the menus are the same, the UI elements aren't dissimilar and you have the same applications pre-loaded on each phone. This new skin was designed to be exclusive to the phone, giving users a chance to feel elite and oh-so special. Do you feel like your life isn't yet complete because you don't have this special theme? You can now die satisfied, as someone has unsurprisingly found a way to port it to the Bold. For better or worse, that gives theme lovers one less reason to go with this device. Although, how many reasons did you have to get it in the first place? The P'9981 isn't going to change the world. It won't fight hunger or cure diseases. Yet to the general population, that's exactly what it's expected to do for a whopping $2,350 sticker price. The first Porsche Design smartphone will be a screaming deal to anyone who has way too much money to burn and just happens to crave a "fashionable" BlackBerry. For the rest of us, we see this for what it truly is: a BlackBerry Bold 9900 in a fancy Halloween costume.